To be a construction contractor involves strategic relations with enterpreneurs, clients, governments, engineers, subcontractors and suppliers. Business leads pour in from multiple sources-referrals, social media, networking, etc. Without Salesfundaa CRM software monitoring and managing the network of work process is tedious and a mistake can add up to enterprise cost. Salesfundaa CRM software enables you to get an insight into functional roles and relationships and aims towards optimising productivity around on site operations as well as marketing strategies. 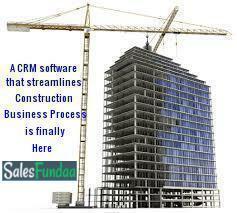 An on-site, Salesfundaa CRM software provides crucial information that on Site Managers oversee. It gives a clear vision of many aspects of a construction project, like allocating resources, managing the delivery of materials, delegating tasks and ensuring quality and safety throughout the whole process. To be more precise project visibility, that requires information around available resources, time and labor, the supply chain, as well as project-related documentation. Salesfundaa CRM software can deliver it through your choice of desktop or mobile device which is more convenient than an on premise option. Due to its easy user interface, deploying one can rid you of appointing specialised workforce just for that. It correlates different pieces of data and brings it on one common platform that can be accessed from easy dashboards for a clear strategic vision of your business. It also has configurable reports and additional self help evaluative tools to give otherwise not so software savvy contractors capabilities to analyse data for immediate business insights. The Advantages any day outweigh the traditional supervisor monitored process. The streamlining that it offers is uncompassed simply because it empowers your supervisor to execute productivity. Beyond this it plays a very important role in keeping track of project bids and follow up activities. It gives Real-time access to project-related documents and gives visibility and scheduling for operations. It helps in streamlining the construction business complex supply chain thereby improving supplier relationships. It can efficiently track time and labor spent on tasks and goals and gives real time access to business data and analysis. It can keep a track of inbound and outbound leads, and run targeted campaigns. It gives social media networking to meet clients where they are and take advantage of immediate opportunities. It allows sales staff to follow up with prospects and clients in timely and effective manner. It can help the administrator observe privacy of his work process by assigning rights. Which means your workforce has an access to information only related to their field of work. It gives multi location operation. It is gst compliant for easy and quick transactional documentation. Most importantly it can be scaled to meet HR and payroll management, Logistics etc. It can be customised to have your own tailor-made version for a more personalised experience. Call us on 9235 35 35 35 and request for your free demo today.